Tarer Braryn is a Dunmer crusader and Curate in the Temple in Vivec. He recently insulted Arch-Mage Trebonius Artorius, who cursed him with a rash. 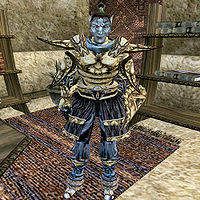 Latest Rumors: "The Bemis gang has taken up in the tombs somewhere below Vivec." This page was last modified on 2 July 2018, at 00:40.